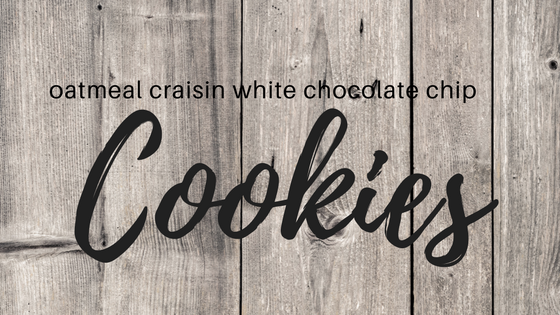 If you’re looking for a delicious cookie to end the year with, I’ve got a great recipe for you! Line two cookie sheets with parchment paper and heat your oven to 350 degrees. Beat butter, sugars, eggs and vanilla for 5 minutes. In another bowl, combine oats, flour, baking soda, baking powder, cinnamon, and salt. Add to butter mixture 1 cup at a time. Mix in dried cranberries and white chocolate chips. Drop by spoonfuls onto cookie sheets and bake for 11-12 minutes. Enjoy!! Happy 2018! What is one goal you have for this fresh, new year?